Little Miss A handing out the presents. If someone said, "I wonder what's in this package?" she put her face close to and said, "it's a surprise!" Grandpa dancing with the Little Misses. Little Miss S snuggling with her auntie. Laughter. Together. Glowing fire. Thoughtful gifts. Sparkling lights. Red dresses. Dinner while the little ones napped. Hugs. Cuddles. A late afternoon walk. So much joy. Eagle eyes may note that next year there will be another little one to love. Little Miss A's sibling is expected to arrive in mid-February. More joy! Christmas is so much more fun with little ones, but alas there are no grandchildren for us yet. It looks like your family had a wonderful time together. Beautiful memories of your family's 2013 Christmas............and how lovely there's going to be another little darling in the photos next year! Now onward to a New Year - may it be full of blessings for you all. We're off now to collect our Jasmin from her driving instruction class - she's now doing the highways and byways which is scaring me silly! I took note of the new little one to arrive this winter … how blessed you all are! Family Christmas photos show those missing, the losses. and the new ones that arrived during the year. Such a nice collage to tell the story! Oui, j'ai vu le ventre tout rond de la future maman ! Quelle bonne nouvelle ! Noël chez vous a l'air très joyeux et chaleureux. Tous mes voeux pour les fêtes de fin d'année ! Wonderful…all of it. Delighted for your new arrival in February. Wonderful moments captured and so exciting to hear another will soon join your dear family. Lovely and precious little ones Lorrie. The best kind of Christmas with family having fun together, your collage of photos is lovely. Congrats on a new little one next year! This 'eagle eye' missed that very obvious sign of impending birth. How exciting for you all! Wonderful and delightful photos of your Christmas, Lorrie. What great shots of your family Christmas! Congrats on the exciting news of a new little grandbaby arriving soon! Melissa is anticipating Jan 2 for the arrival of baby boy Davies! They are all very excited ! I get to take the day off and spend it with Corban and Keegan before we get to go up and meet this new little one! Sharing the day with little ones is bound to make the occasion magical! Best wishes to you, my friend! Lovely collage and how Blessed you are, Lorrie. Wishing you a very happy and Blessed New Year. Oh my - what glorious fun - and a new baby too - such excitement. Those little gals are so darling! They sure bring the season to life. Looks like a lovely time together. Beautiful pictures. Lots of fun. Such beautiful photos of your family Lorrie! The little girls look so sweet - a magical time for them. Lovely family photos and beautiful words of a festive, family Christmas! Such joy! Wishing you all the very best of health and happiness in the new year! What a joyful time! So happy to read that your tribe too will increase next year! Oh joy! A new grandbaby to love! I really enjoyed seeing your "distilled" Christmas. Beautiful images! Christmas with little ones is so much better! Our 2nd grandchild is due mid-Feb, too! 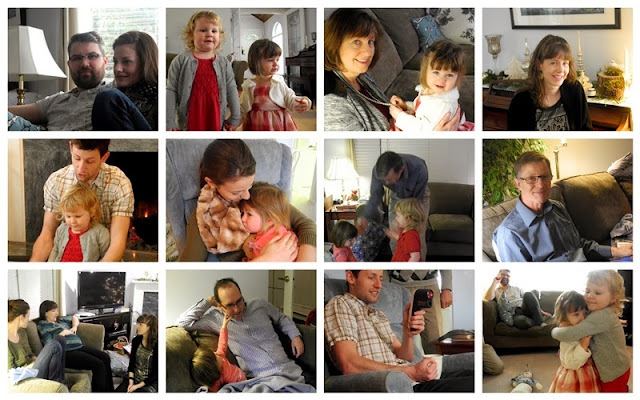 Loved these little glimpses of your family Christmas. I know those two darling little girls added so much to the joy and happiness and now there will soon be another one to love. So exciting!! Congratulations to all of you. Such wonderful memories you've made...enough to last a lifetime! Congratulations on the upcoming addition to your family tree...how exciting!!! Wishing you, and your family, a very Happy and Healthy 2014! And another on the way, how very exciting! Sweet little tokens of Christmas 2013! Lorrie, I just love the little peeks into your Christmas. Such Joy. I wish you and your family God's very best for 2014. We don't know what the year will hold but we know who holds it!